Last weekends couple wanted something different to the traditional wedding cake. 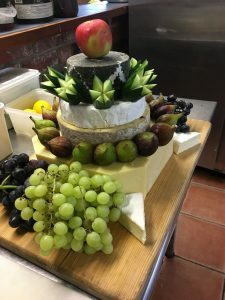 We provided them with a cake of cheese and all the trimmings. The cheeses, all locally sourced, were Devon Cheddar, Somerset Stilton, Cornish Brie & Yarg. The trimmings included grapes, fresh figs, celery, homemade chutney & breads/biscuits. Please, ask us to provide you with a quote. When you make a booking enquiry to us! 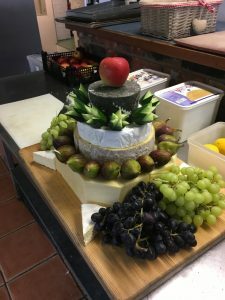 Scoff Catering is situated in the Heart of Devon and is dedicated to bringing you fresh, local produce and a quality service at affordable prices. 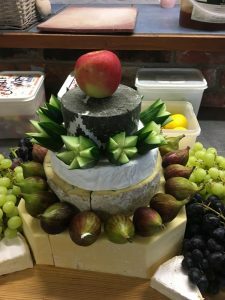 Whether it is a wedding, private party, intimate family occasion or a corporate function we can advise you and cater for all aspects of your event, no matter how large or small. Copyright © 2019 Scoff Catering - "Make Your Vision Happen"